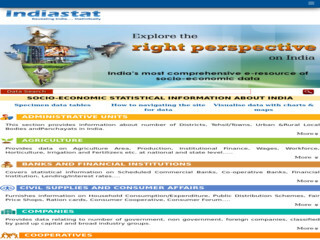 A Portal which provides a comprehensive socio-economic data about India and its states/sectors on internet. Collection of latest socio-economic information about India from diverse sources but also to present the same in already to use format. Over half-a-million pages of statistical data have been qualitatively analyzed, Condensed and presented in a user friendly format.